Know your APGLI Policy Details, Search the APGLI Policy Number and get the APGLI Annual account slip at apgli.ap.gov.in…. A worker’s welfare is one of the key things that should be looked into for them to effectively perform their duties and increase an organization’s output. With this in mind, the Andhra Pradesh Government Life Insurance Department (APGLI) website has been developed to cater for the welfare of all government employees in India. The APGLI website is run by the APGLI Department which is a governmental agency that controls the APGLI Scheme and is under the Administrative Control of Finance Department. Through this website, all the APGLI tasks are swiftly carried out in order to look into the needs of government employees. Downloading the Policy Bond is a walk in the park so long as an employee has a Policy Number and can get access to the APGLI Website. First of all, a person has to access the APGLI Website by typing http://www.apgli.ap.gov.in/ on their browser. Once inside the website, one is required to click on the policy bond tab which will then redirect them to a different page. In this page, an employee is required to key in, their APGLI Policy Number, in the space that has been specifically set aside for this purpose. After, putting their Policy Number, one is then supposed to select the suffix by typing A/B/C/D in the suffix option. An employee’s date of birth is then keyed in before entering the captcha that is displayed in the image. Once all the details are filled in, an employee can be able to download the APGLI Policy Bond by clicking on ‘Get Policy Bond’. Click on Policy Bond tab. Key in your policy number in the space allocated to policy number. In the suffix, select A/B/C/D. Enter the date of birth. Click on “Get Policy Bond” and download the Policy Bond. For a person that is using chrome as their browser, a message on the menu bar may appear. If this pop-up blocked message appears, one is required to click on it and choose allow pop up. The employee will then be able to download the policy bond. Employees using Firefox as their browser may also get problems in downloading the Policy Bond since it may block pop-up windows that make downloading anything impossible. In this scenario, one should allow pop ups for the APGLI website and then download the Policy Bond. A government or local body employee in India can easily view their policy details on the APGLI Website by first searching for http://apgli.ap.gov.in on the browser. After gaining access to the website, a person is supposed to click on the policy details tab that will then redirect them to another page in the APGLI Website. An employee is then required to enter their policy number in the space provided for this detail. The next step is to put your date of birth starting with the day, month and finally the year. After keying in all these details, you should enter the captcha as it is on the image before clicking on “view details”. Once all this is done, you can be able to check your policy details without any problem. Click on Policy Details tab. Click on “View Details” and check your Policy Details. Search for http://apgli.ap.gov.in/Home.aspx on your browser using either chrome or Firefox and access the APGLI Website. Make sure that you have an internet connection before you access the site. 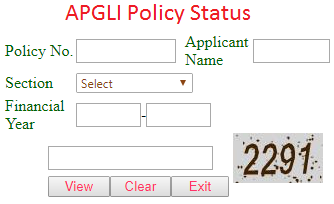 Click on the Policy Number Search tab once you have access to the APGLI Website. In the box provided, enter a part of your name. For example, you can key in Rey if your name is Reyansh. Enter part of the father’s name in the space allocated for this detail. Key in the date, month and year of birth. Correctly enter the captcha number that is generated in the image. 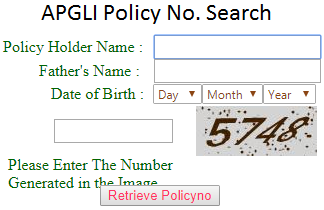 Click on “Retrieve Policy Number” and get the policy number that you are searching for. Open http://apgli.ap.gov.in/Home.aspx to access the site. Put your policy number in the space allocated for this detail. In the section detail you can either fill it with issue of policy, loan or claim. Enter the captcha number that has been generated in the image. Finally, click on “view” to check the policy status, “clear” to erase it and “exit” to leave the page.